New for 2019 - New Gas Grill and New TV! ALSO we now have WIRELESS INTERNET and Direct TV with over 200 channels! Limerick is a friendly community that offers restaurants, ice cream shops, 2 pizza shops, a donut shop, full grocery and hardware store, gas station, clean laundry mat, all within 2 miles. For the more adventurous, Portland is 45-minutes to the east, and North Conway is a 45-minute drive to the west. There you can find movie theaters, shopping and a variety of restaurants and other attractions. Sanford Maine is 30 minutes to the south with a public golf course, a miniature golf course, movie theaters and dining. We want you to have a great vacation at a reasonable rate, and we’ll do what we can to welcome you to our cottage and to Limerick. Please feel free to contact us at the number listed on the right side of this page. Thanks for looking. New for 2015 - we now have wireless internet and Direct TV with over 200 channels!! We have been on Lake Sokokis for over 40 years. We love this lake and our summers in Maine. 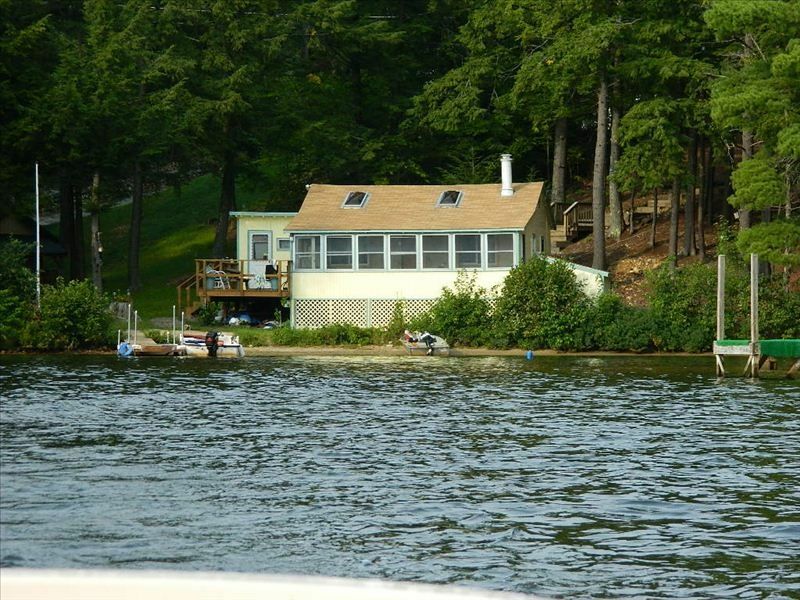 We have a house across the lake from the rental, and will be there to ensure you have a wonderful vacation experience. We have been on this lake for over 40 years and it's a reasonable drive from Massachusetts and New Hampshire. We live for summer and our cottage offers all the best summer has to offer. Limerick offers everything you could need: restaurants, grocery store, shopping but most of all the lake. You don't need to leave the lake to be entertained, but if you chose to, there are so many attractions with in a short drive that we believe it's the perfect summer vacation spot! You couldn't get closer to the water! Rowboat, life jackets included, priviate dock, public boat ramp so you can bring your boat or jet ski. I had the time of my life! I wanted to come to Maine since I was 18 years old and now I’m 41 and my wife surprised me with this trip. The cabin was amazing! Kim was so helpful thru the whole process and even checked on us by texting me during my stay to make sure everything was perfect. I can’t wait to visit again! Thank you so much Kim. Beautiful lake side get away. Simple cottage; clean and cozy. Kim was an excellent host and provided us with some local off road trails for our Jeep. The inclusion of a welcome gift basket was a nice touch. People should understand that as Kim described, there are a good amount of stairs down to the cottage. A well worth walk for being so close to the water. This is a cottage/camp. Must be comfortable with nature as this is not a hotel. Would stay here again. My stay at the cottage was short but sweet. The owner and host, Kim, is exceptionally welcoming and thoughtful, leaving tourist information, locations of the supermarket, laundromat, etc., basic dog supplies, a bottle of wine, and some snacks, in addition to clean sponges, complete cleaning supplies and directions for the tv and various electrical switches. Since the weather was rather cool and drizzly, I appreciated the electric heat but wished for better reading light in the living room. There is a very nice, bright sun room with a day bed (could be night bed too) that had I stayed longer I would have enjoyed. There are woods adjacent to the cottage that my dog and I enjoyed very much. A highlight for me was the blueberry farm—14 varieties, u-pick from July through October. The cottage is located in a little cove and there is a dock and a rowboat. The neighbors in the cove all seem to have power boats and I did wonder if things might be a bit noisy during the summer season but in September the lake was very quiet. There are 15 or so high steps down to the cottage from where one leaves a car. I am an older person and these were awkward for me to navigate but there are a railing and lights. Getting into the small town of Limerick was very quick and convenient. In September the town was pretty quiet, and I imagine during the summer it’s more lively. Hospitality was great. Kim had a welcome basket for us with a few essentials. Everything was simple to find and convenient. Cabin was clean and well stocked. What I really liked was that there were no surprises everything was as advertised. Thanks for the hospitality. Just a great little cottage! We really enjoyed our stay here. The weather cooperated so we went swimming every day. The cottage was equipped with everything we needed, and our hostess provided great recommendations for dinners out. The cottage was just a perfect size for two couples. We would definitely stay here again, if we were in the area. This cottage is a lovely little spot. Perfect for my husband, me and the dog to relax on the deck, dock and the water. The fire pit is a great perk. We enjoyed that a couple of the nights we were there. However, the gas grill was very old, dirty, and had clogged jets. The igniter did not work either, so lighting it with a lighter was not safe to say the least. The twin beds were very soft. So upon waking, our backs were very sore. And if you are older or have bad knees (like me), the stairs leading up and down to the cottage were brutal. They had a very high rise and were steep. But all and all, we had a nice stay. Everyone we ran into was very friendly. We had a lot of fun watching the activity on the lake. I'm glad you enjoyed your week at our cottage and I do agree, it's a lovely spot! We did replace the interior parts of the grill at the beginning of the season, but based on your comments, we will be purchasing a brand new grill..
Jet skis allowed, tubing, canoeing. There's several great orchards for strawberry, blueberry and apple picking within 5 miles. Several great restaurants in town, one accessable by boat. Ocean is 45 minutes away and outlet shopping 45 minutes north, and Portland Old Port about 50 minutes drive.